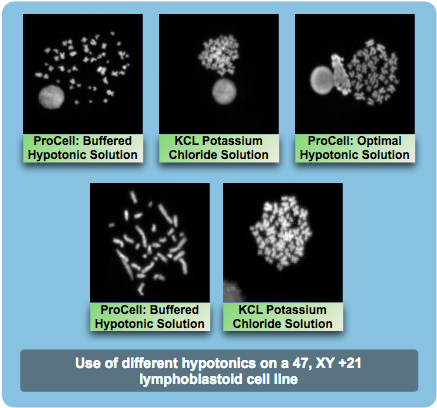 Optimal Hypotonic Solution is a newly formulated hypotonic solution which achieves optimum metaphase swelling (spreading) from difficult cells that are prone to either under-spread or overspread, and where conventional hypotonics achieve inadequate cell swelling. Optimal Hypotonic Solution increases cell volume allowing the chromosomes more room to spread out. Well spread chromosomes with few crossovers greatly aid analysis. Although developed for acute leukaemia bone marrows and tumour specimens, it has also proved useful with problem blood cultures and other problematic sample types. 1. Add the contents of the supplied bottle to a 1000 ml volumetric flask. 2. Bring to 1000 ml with milli-Q water or reverse osmosis-filtered deionised water. 3. Store at 4°C in a clean glass bottle, noting down the date on the bottle. 4. 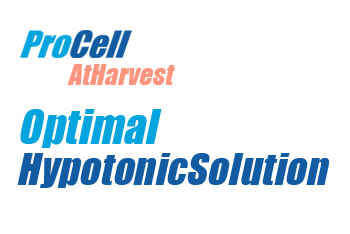 During harvest replace your existing hypotonic solution with Optimal Hypotonic Solution. 5. Replace your existing hypotonic and incubate cells at 37 ° C for a maximum of 30 minutes. 7. Continue with your usual harvesting protocol.